The only thing for me to do is to follow your example and swrite short letters often, instead of trying to write long letters once in a whitle. Because “once in a while” for long letters never come for me anymore, it seems—and I'm utterly ashamed when I realized how long it's been since I've written to you. Not even when the lovely presents came—oh, I'm a perfect outrage! 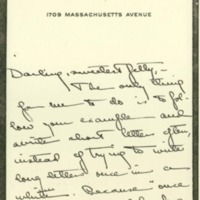 Darling, it was so dear of you to remember to write to me for my birthday and to send me a present. I love the beautiful little collar and, as for the wedding present, we use it every day for breakfast and often for lunch with our blue plates and it's a perfect beauty—or rather they're perfect beauties. Thank you—and Frank—with all our hearts. Mac is crazy about them. It's so fine to hear direct news from you from Helen and Margie—news, I mean, that you can't tell us yourself, about your beauty and general darlingness. We have known that news ever since we met you but we like to hear it again every now and then when we don't see you! Oh, you darlingJetty, if I could only tell you how I long to see you I had a faint hope a little while ago that we could go up there—Mac thought that it would be bully to run away and rest with you all and write his report, which has to be in by the fifteenth. But he found that after all he couldn't write it away from his office where all the “data” etc— is and so we can't move from here until that's done. Nobody knows how disappointed I was—it would have been so heavenly to have been up there with you. Your house must be perfectly adorable from all I have heard about it. Don't you think our darling Helen looks well and perfectly beautiful? Tell her—oh no, she won't be with you when this letter gets there, I reckon. Doesn't Margie look well too, bless her heart. She's so splendid. I wish I could tell her to run or do something to take off a little flesh tho, because she's almost spoiled her pretty little figure. But I'm afraid I'll hurt her feelings. It's so wonderful that you're going to be here for Christmas and the Glorious Event—you don't know, darling, how happy I am at the thought of it. I can hardly wait for the time to come. How you must miss Frank, dear. I can't bear to think of being away from Mac for a few days even—but I hope he's back by this time—I mean by the time this gets there. I haven't another second because it's lunch time—so good-bye my precious, precious sister—I love you, love you, love you—Best love to my bully brother and heaps to you both from your brother. McAdoo, Eleanor Wilson, 1889-1967, “Eleanor Randolph Wilson McAdoo to Jessie Woodrow Wilson Sayre,” 1914 November 13, WWP17504, Jessie Wilson Sayre Correspondence, Woodrow Wilson Presidential Library & Museum, Staunton, Virginia.